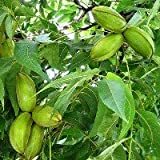 Pecan tree for sale – before deciding to buy a pecan tree, you should be aware that most pecans grow tall at least 30 feet tall and may surpass 70 feet in height. If you purchase a pecan tree for sale recommended grafted tree, plenty of room for canopy growth will be needed. Planting multiple pecan trees will require at least 60 feet of spacing between trees. For this reason, it is not recommended for people with small lots and should be planted away from homes and structures. Planting – do not allow the root of the trees to dry out before planting. If possible, you may soak them in a tub of water beforehand. Choose an area with full sun and loamy fertile soil that is well draining. Hilltops or a sandy loam near a creek are ideal spots to plant pecans. Dig a hole that is 3 feet deep and 2 feet wide. Position the plant in the center and do not add fertilizers directly into the hole. Avoid deep planting your pecan tree as its roots may die from lack of oxygen, leading to tree stress or death. In addition, trees set too deeply are often easily blown over in a storm when they reach 15 to 20 years of age. Watering – water weekly for the first 2 to 3 years after planting in the absence of rain. You may do this by applying water slowly and deeply; allowing the soil to absorb as much as possible. In mature trees, water often enough to keep the soil evenly moist from the time the buds swell until the time of harvest. The number, size, fullness of nuts and amount of new growth is determined by the soil moisture. So water often to maintain your soil moist. Another option is to add mulch around the base of the plant to keep moisture in and prevent weeds as well. Other caring tips – after planting, prune the plant up to one half of its top part to encourage new growth. The trunk should be protected from cold damage, herbicides and wildlife for the first three years. You can do this by simply painting the trunk with white latex paint. Feed you tree with Zinc-rich fertilizer as this is needed for pecan tree development and nut production. 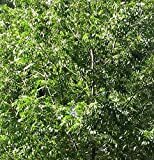 The recommended dose is a pound of zinc sulfate each year for young trees and three pounds for nut-bearing trees. Harvesting – Pecan trees, in general, takes about 6 to 10 years after planting before they begin to produce good crops of nuts. Do not allow nuts to lie on wet ground. Harvest early as soon as the nuts mature and store them in a clean dry place.